The 79th Annual Academy Awards were held here in Los Angeles last night. 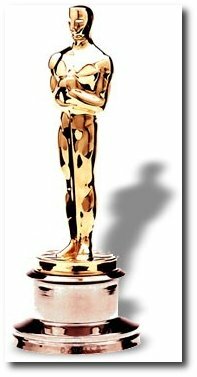 The "Oscars" are one of the biggest events anywhere in the world and when it happens in your town, there is a certain added excitement. I guess most of my excitement disappeared when I heard that Ellen Degeneres was the host. Is it just me or are there others that don't find her so funny. Bring back Chris Rock anyday. I guess some of the interest came back when I saw that Deepa Mehta's water was on of the films nominated in the Foreign Language Film category. Unfortunately it did not win the award and I was a tad disappointed. Its probably a bit ironic that India being the largest movie churner has never won an Academy Award. I guess Rajanikanth flinging a cigarette in the air, lighting in the air with a gun and dropping it in his mouth or Govinda gyrating his hips (Main to raste pe jaa rahaa tha) is not award winning material. What does the academy know, right? I thought Jennifer Hudson was going to have a "Wardrobe Malfunction" during the show. Some of the shadow effects especially the one for "The Departed" was pretty cool. Thats all I can remember. Till next year.....Its a wrap.